My Baggage provides student shipping with tracking, so you can monitor the whereabouts of your belongings online, every step of the way. We understand that when you send your luggage with a shipping service, you want to make sure that it’s in safe hands – after all, these are your personal possessions. Our full online tracking system lets you monitor the progress of your shipment. You’ll be able to see when your luggage was collected, when it is in transit, when it’s out for delivery and when it has been delivered. And, for that extra peace of mind, we also offer email and SMS notifcations which you can opt in to receive by logging into the ‘My Orders’ section of our website. To access your tracking, simply log in to the ‘My Orders‘ section of our website once you have made your booking. 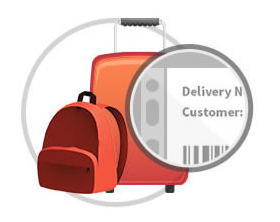 If you need to get luggage to or from university, My Baggage can help. We offer fast, reliable and low cost student shipping within the UK and worldwide, to 200+ countries. We’ll transport your luggage from your home straight to your university or vice versa with our convenient door-to-door service to save you from any hassle! Sending your luggage with My Baggage is simple – all you have to do is book and pay for your shipment online. Tell us where you want it collected from and delivered to. You can also choose a date which suits you and you can book as far in advance as you like. After booking, we’ll take care of the rest. We’ll collect your belongings and deliver them right to where they need to go. And it’s all for a price you can afford. As well as our online luggage tracking tool, we also have a dedicated customer service team on hand, ready to answer any questions you might have about the service via phone, email or live chat. Contact us here. If you’re an international student, My Baggage can help you too. We send luggage to over 200 countries worldwide, so no matter where you’re going, you can book your shipment and we will keep you in the know with our online tracking tool.